DUBLIN, Ireland -- Dublin is Ireland's largest and most tourist-friendly city, with marquee attractions from the Book of Kells to the Guinness brewery. 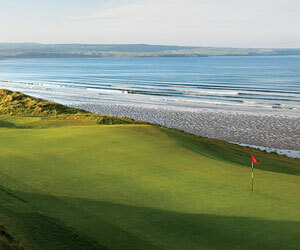 But Ireland's best known golf courses are almost all on the west coast, in the northwest or in Northern Ireland. Because of this dichotomy, many golfers on wish-list trips to Ballybunion Golf Club, Lahinch Golf Club, Royal Portush Golf Club and so forth simply come and go via Shannon airport and never set foot in the capital. That's a real shame, because a trip to Dublin can combine the charms of all things urban and Irish with exceptional -- and inexpensive -- links and parkland golf. The tourist heart of Dublin is Temple Bar, along the south bank of the River Liffey near the center of town (like many European cities, the Liffey cuts the city in two from east to west, spanned by numerous pedestrian bridges). Temple Bar is a maze of small alley-like streets, many pedestrian only, lined with pubs, clubs, eateries and live music. It's frantic and definitely aimed at tourists, but if you want to be someplace where there is lot of action within walking distance of your hotel -- with a path of least resistance to experience the city -- this is the place to stay, with top choices including the Paramount, the Temple Bar Hotel and the top-shelf Clarence, famously owned by U2. The chic part of town is the quieter and pricier area around St. Stephen's Green where the city's top two luxury hotels, the Four Seasons and the Merrion, can be found, along with the more reasonably priced Conrad and Hilton Dublin. The area around Trinity College is a compromise, offering a still easy walk to Temple Bar with less craziness, collegiate flair and proximity to the Book of Kells, the famously illustrated ninth-century Bible that is the city's single biggest attraction. Here, the top choices are the Westin and Westbury, and for bargain seekers, the Trinity Lodge. The other must-see is the Guinness Storehouse, maybe the best brewery tour in the world, complete with a pint of Guinness or Harp in the 360-degree bar atop the brewery with expansive vistas over Dublin. Other top attractions include Dublinia, a recreation of the medieval city; Phoenix Park, the biggest city park in Europe; Dublin Castle; and the National Art Gallery. Restaurants in Temple Bar skew towards mundane, but Gallagher's Boxty House is a fun place serving some traditional Irish fare you won't see elsewhere. Another good bet is the Ely's trio around the city: Ely Winebar, Ely Bar & Brasserie and Ely Gastropub. For a fancier dinner out, make the short (10-minute) trip to suburban Blackrock where Clodagh's Kitchen does excellent modern Irish farm-to-table cuisine. From any of these downtown neighborhoods, it is just a 10-15 minute drive to North Bull Island, a name that won't ring many bells with golfers but should. In the 18th century, the bay had a problem with silt and storms, so a massive stone sea wall was built in 1825. Over the next half century, so much sand was trapped around it that an entire island formed -- three miles long and half a mile wide -- almost exclusively of sand. The best possible surface for golf. There are two true links courses on this sandy spit that is exposed to the sea in all directions, Royal Dublin Golf Club (1889) and St. Anne's Golf Club (1921). In a dead heat for quality, both are very good layouts -- shockingly good given their proximity to downtown and the cost. St. Anne's is a steal at just €40, as good as links courses costing four to five times as much, though it only allows visitors on weekdays. Royal Dublin has history and the "Royal" designation on its side, the only such example in the Republic, and is the longtime home course of Christy O'Connor Sr., a Hall of Fame member who was the first golfer in history to play 10 consecutive Ryder Cups. It gets €75-€120 with a €60 replay rate for 36. The other great unheralded nearby links course is The Island Golf Club (1890), the very best of the bunch, though not actually on an island. It's an undulating and natural links just 15 minutes from the airport (you'll see it as you land). It's another bargain at €55-€120 with various special offers. Dublin has just one truly famous course, Portmarnock Golf Club (1894), near The Island, which is far better known than any of its peers but not a far better course. Yet it is the only one of these that is hard to get a tee time on (€175). If you have a car and wish to go farther afield, the 20-hole European Golf Club is the best course in the greater Dublin area, though it's a good 90-minute drive south, and Headfort Golf Club is an exceptionally well maintained club with two beautiful and worthwhile parkland courses, just 35 minutes from Dublin and ultra-welcoming -- and another bargain with greens fees of just €25-€50. Nice piece, Larry, but as an Irish golf writer I'm not sure I can agree with you about Ireland's best known golf courses being almost all on the west coast, in the northwest or in Northern Ireland. Portmarnock and The European are in most magazines' top 100 courses, with Royal Dublin and The Island not far behind. Slightly to the north is County Louth (aka Baltray), where Shane Lowry won the Irish Open as an amateur in 2009, and it makes the east coast and Dublin a very attractive spot for links enthusiasts. Great to see The Island getting the credit it deserves and nice to see Headfort included as well. If you're back this way, a visit to Corballis, next door to The Island, should give you a few links surprises. It's a public course and thoroughly entertaining. Good luck.